Take this quiz to find out if you're a clutter bug, and if you are, what to do about it while still loving and accepting yourself. 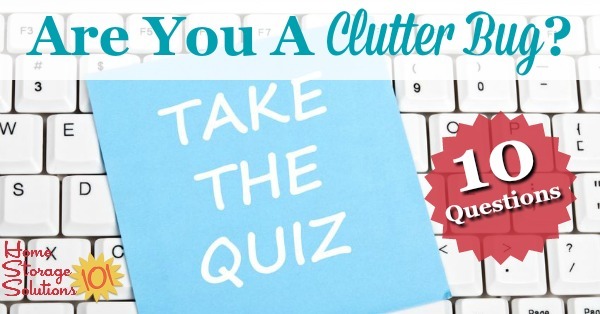 This quiz is meant to help you assess whether you have some habits that could lead to clutter taking control of your house, either now or in the future. It is not meant to make you feel bad about yourself, nor should it. Remember, habits can be changed, and if your house is currently cluttered, it didn't happen overnight, and the fix won't happen overnight either. Honestly, if you don't answer yes to a couple of the questions below in the quiz you are a modern day Felix Unger, and are too busy arranging toothpicks into neat rows in their box to have any fun. That's not what we want in life, is it? With that reality check in mind, and your self-loving mind set in place, here are some questions to answer. There is no scoring for this quiz, per se. Just answer the questions honestly, and privately to yourself. Question 1: Do you constantly hunt for things you've misplaced in your home, or put into a stack or pile? Question 2: When you look in your kitchen, do you see flat surfaces, such as counters and your kitchen table, or are there piles of paper and mounds of appliances? Question 3: Do you end up buying a second (or third) of an item for use in your home, because you can't find the one you already own? Question 4: Do you shop for "retail therapy" or only when you really need something, and have thought about it for a while, not on impulse? Question 5: Is there a place for everthing in your home, and everything is in that place? Or, do you not have room to put some of the stuff you own away? Question 6: Do you not pay some bills on time, not because you don't have the money, but because you can't find them to pay them? Question 7: Is your dirty laundry mixed up with your clean laundry, and all of it lying on the floor because your drawers and closets are all packed with too much stuff to fit anymore in? Question 8: When you need a pen do you have about 50 to choose from, but most of them don't have any ink in them or are otherwise broken? Question 9: Do you keep every plastic food container you accumulate, but can never find a matching lid when you need it? Question 10: When you come home does it feel like your little sanctuary or peaceful respite, or do you feel stressed out in your space because of all the "stuff" there? 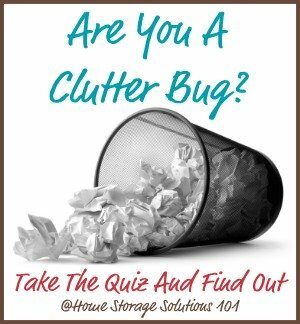 Well, Are You A Clutter Bug? And If Yes, What Should You Do About It? If you answered more than half of the questions above with a "yes" you are most likely a clutter bug, or on your way there. Even if you aren't feeling like you've got too much clutter right now though, if you answered yes to several of the above questions and you continue with some of the habits you currently have you may one day wake up with lots of stuff in your home that is robbing you of peace. Houses with too much stuff in them can be physically, emotionally, and spiritually draining, and that is what takes away your peace of mind and joy of heart. So, the first step is recognizing there is a problem. The next step after that is definitely not to beat yourself up about what has already happened. 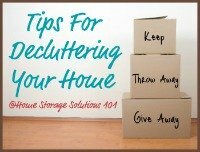 Life can be very busy and hectic, and decluttering and then maintaining a clutter free living area takes some work. That's why clutter happens to the best of us sometimes, and you are not alone. Therefore, the next step is to tackle the mental and emotional part of being a clutter bug so we can begin to create and maintain new habits that will get us to the peace of mind and joy of heart we desire in our lives. 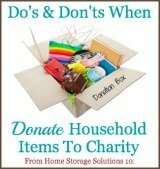 Next week, as part of the decluttering your home series I'll discuss "what is clutter? ", and some guidelines you can use to identify it in your home.